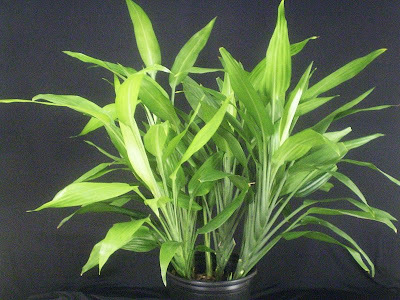 On June 8, 2009, I bought a Dracaena thalioides from my ex-job. (Posted about it here.) At the time, I was pretty excited about this, because this was the first time I'd had the chance to get one, and they're one of those plants like Pandanus veitchii that I only knew from books. Not even as many books. And it's not an un-handsome plant. Not flashy, granted, but I've seen worse. 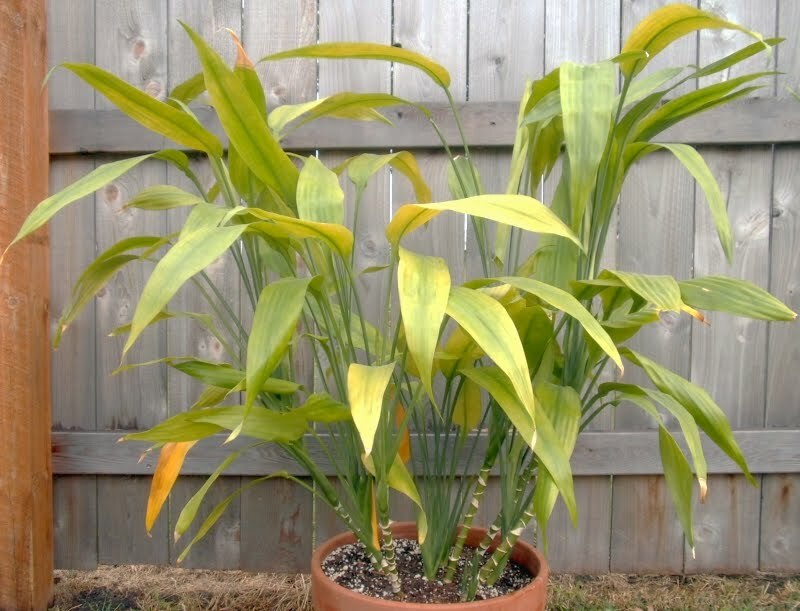 Plus it's a Dracaena, so I was figuring that probably it'd be pretty trouble-free. It seemed like a solid investment. Notice how green and full and lush-looking. And then it almost immediately turned yellow, which I assumed was a nutritional problem of some kind, so at one point or another I tried everything I could think of: fertilizer with and without trace nutrients, fertilizer containing nothing but trace nutrients, epsom salts, acidifying the soil, changing the soil, etc. And nothing worked. At the same time, it also developed a raging spider mite infestation that was, now that I think back, probably the actual reason for the yellowing -- once a plant's leaves turn yellow from spider mite damage, they're that way forever -- but I also tried everything I could think of to get rid of the mites too (neem oil, spraying soapy water on the plant and then sticking it in the shower, soapy neem, hand-wiping every individual leaf top and bottom with soapy water, spraying all the leaves top and bottom in the shower, every time I watered, etc. ), and they Would. Not. Go. Away. Plus I think the D. thalioides was serving as a spider mite reservoir for everything else in the area (mostly Dracaena reflexa 'Riki,' though I also saw them more than once on Anthurium andraeanum, which is unusual for Anthurium), which meant spreading around even more neem, more soapy water, etc. Though really, it's looked like this for almost a year. I just haven't had the heart to give up on it until now. There are sites on-line that apparently do sell D. thalioides, mostly European, and they appear to be available as landscape plants in Florida, or at least parts of Florida. And, strangely, Water Roots appears to have had one in Canada at one time, according to a photo; I don't know how that worked out for her. (Are you reading this? How's the plant now?) How anybody manages to get this to work without the spider mite populations getting so heavy that they bend the stems over, I have no idea, but D. thalioides is one plant I will not be trying again indoors. Happily, the other four plants I bought at the same time (the Big Damn Screw Pine, Senecio macroglossus, Furcraea foetida 'Medio-Picta,' and Zingiber malaysianum) are all doing much better. The Zingiber has done so well for me that it's become one of my favorite plants, in fact. And I already knew I loved Pandanus. So just the one dud from that batch, which is not so bad. But seriously. Worst Dracaena ever. Do not buy a Dracaena thalioides. Unless Water Roots tells you you may. And you have a really clean establishment to buy from, that offers a money-back guarantee. Don't feel bad, Mr. S. Mine didn't work out either. I didn't have a lot of problems with spider mites, although I did have to deal with them at some point (it just never got really out of control), but the plant just didn't grow well. It looked amazing for awhile, and then it just declined. I don't know what the &%%&%& its problem was (I tried everything), but I didn't wait as long as you to get rid of it; I lost patience very quickly. I had too many other plants to care for and wasn't in the mood to waste too much time with this one. My mother, who has the momma plant (she gave me an offshoot), well, her plant is thriving. Aside from the fact that it's huge, it is absolutely gorgeous (dark green, wonderfully healthy leaves). And she doesn't do anything special. Nothing. Doesn't feed it. Doesn't wash its leaves. Repots it in fresh soil once every few years. I don't know why her plant is so happy. Maybe it thrives when it's neglected. Or abused. In any case, I wouldn't recommend this plant to anyone, especially a beginner. unless you are into collecting spider mites, it doesn't seem worth the effort to have this plant. You bought it at $39.95? That's really expensive. I'd spider mite on two of my plants too, Beaucarnea recurvata and Dieffenbachia 'Reflector'. I couldn't beleive that it happened on the latter, because I thought dieffenbachia is always pest free. Anyway I got rid of the pest with just wiping every leaf with moist cloth. Oh geez - spider mites creep me out! And I've never seen an infected Anthurium, you poor darling! I'm proud of you for cutting your losses. Interesting and horrible. Last friday, I discovered my bell pepper plant (doing marvelously until now) had a significant spider mite infestation. I was prepared to ditch the entire thing, but I decided to treat it first. I used a decoction of about 7 smaller garlic cloves, a palmful of whole cloves (the spice), and a habanero pepper. I added that once cooled to a cleaned spray bottle that had molasses and neem oil in it already, shook well, then applied to the plant. As of this morning, the bastards look like they died or ran off. I'll keep a close eye on the plant for the next week or so and advise. I mean, not good for either of us, or for the plants: good that the species isn't singling me out. It's possible that my plant was badly infested when I picked it up -- they said that the other D. thalioides on that shipment also had an almost immediate bad mite problem, though they somehow managed to sell it to someone anyway. But it didn't look like trouble when I bought it. If I had it to do over again, I wouldn't have it in an east window, either, since mites really thrive under direct sun. I didn't have a lot of choice, though; it was a big plant, and I only have so many places where I can put those.
. . . is basically what I'm saying, yeah. Though I suppose if you were a mite collector (and you know somebody must be), this would be a handy plant to have. Though I'm sure all the mite collectors probably use Hedera helix instead. Well, yes, it was expensive. But it was also a big, unusual plant I'd never seen in person before and figured I'd probably never see again, plus I thought it was going to be easy to take care of and last a long time, so it seemed justified. I've had spider mites on Dieffenbachia before (a couple tall Dieffenbachias were among the plants that kept getting reinfested by the D. thalioides' mites), though it's only been a major problem on plants that were in direct sun. I've also had minor problems during winter, just because the air inside gets hot and dry. Not a very serious infestation, on the Anthuriums. But you know they're there when you see webbing around the petiole, at the top of the leaf. I've never seen it progress much beyond just a little webbing in between the "ears." Anthuriums are one case where I think my otherwise pointless and time-consuming habit of watering everything in the shower has paid off. That sounds pretty damned intense. You've used it before, successfully? I mean, I don't know if it'd be worth it to pepper-spray myself just to get rid of some spider mites, but it's worth filing the recipe away somewhere so long as it works, I guess. I try not to think about how many plants I decided to leave outside for Jack Frost to do my murderous bidding. A Choisya that hated being pinched back, a couple small cheap succulents that never got enough light inside, and I had no way to furnish supplemental light. My wife's tank goldfish (they still live, just in a pond. Much better for the both of us). You have my sympathy, it's always a hard decision. I waited so long to dispose of my Clivia (mealy bugs) I was also forced to get rid of my Flame Costus, and that hurt. Get your other plants clean and healthy. You could always offer it up for adoption so a south florida reader can pay for shipping and plant it outdoors in their garden! Fresh air does work wonders. Even here in North Florida I keep my houseplants outside in the summer. I'm honestly not crazy about it even when its healthy, and think that there's plenty of other plants for the same look. thanks for warning us! I think it looks great. The beautiful golden/brown hue just makes it look so full of life. Per the homemade pepper spray: I'm cautiously declaring it a success. I resprayed the plant Monday afternoon. Since then, a number of leaves have dropped (half consumed already, so no biggie), but the bugs are long gone. I have no idea what their life cycles are like and if their eggs can remain dormant, but the live ones are no longer with us.